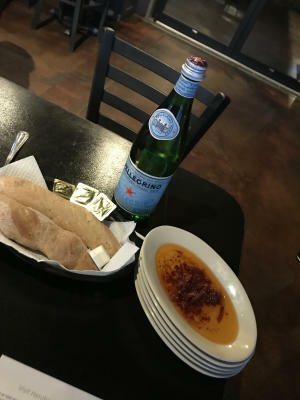 I am a huge fan of Italian food, so when I had the chance to review Nonna’s by So Italian in Plainfield, Indiana, I jumped at the chance. I took my husband and two kids there one evening in the middle of a busy week of work, school, snowstorms, etc. I was so pleasantly surprised by what I found. Nonna’s is managed by married couple Mauricio Trincado and Heva Espay. It is a cozy Italian restaurant offering pizza and Italian options, all homemade using recipes from Heva’s great-grandparents. Heva’s parents, Elizabeth and Felipe Trincado, own So Italian! in Brownsburg. The term “Nonna” is Italian for grandmother. Heva’s great-grandparents moved from Italy to Venezuela during the Holocaust because they were Jewish. Many Italian immigrants settled there, and everyone, even locals with no Italian heritage, would call their grandparents Nonno and Nonna. Hence, the name Nonna. Heva recalls fond memories of her grandmother’s cooking; it was always fresh and local. She even had her own garden. She was innovative with flavors and made everyone feel happy and welcome at her table. 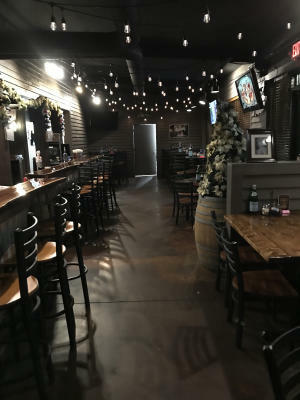 Heva and Mauricio wanted to offer that same atmosphere and freshly made food to residents and visitors of Hendricks County in their restaurant, which is located at Exit 66 just off I-70. According to Heva, the best item on the menu is the Tour of Italy, which allows people to try each of the pastas on the menu. Most of the beer and wine is local, coming from places such as Chateau Thomas Winery, Sun King Brewing and others. Nonna&apos;s caters! Nonna’s does plenty of catering, especially for weddings, and they also cater with Chateau Thomas Winery to pair their Italian offerings with wine (one of the best combos in life, in my humble opinion). Costume coffee drinks (lattes, cappuccinos, etc.) can be crafted all day in their small coffee shop situated right in the middle of the restaurant. Nonna&apos;s serves breakfast on the weekends! Saturday mornings from 8 a.m. to noon patrons can order breakfast items, such as a breadstick (stuffed with scrambled eggs, bacon, ham, etc), breakfast pizza or small sandwiches. Their most popular breakfast item is their homemade cinnamon rolls, made by hand Friday night and ready to bake fresh each Saturday. Nonna&apos;s hosts live music! Stay tuned on their Facebook and Instagram pages for announcements on upcoming live music. My family and I had a wonderful meal. We ordered kids’ meals (an entree that comes with a side and a drink) for the little ones, and my husband and I both ordered calzones, which came with a side salad. We were given breadsticks and oil as we waited for food. We received our salads right away and only waited about 15 minutes for our entrees, even though I was told they may take a while. The food was perfectly seasoned, the crust perfectly crunchy and buttery and the service was warm and welcoming. I&apos;ve also heard their lasagna is quite good and is served with both alfredo and marinara sauces poured on top. They also had a number of other specialty pasta dishes and pizzas on their menu. We didn&apos;t get dessert, but I&apos;ve heard their tiramisu is quite popular and is an old family recipe. The string lights were such a lovely touch, lazily draping all throughout the restaurant, and the music was old-time swingy music that instantly made us relax. If you want a cozy atmosphere for a date night or family meal combined with delicious homemade Italian food, this is absolutely the place to go!